La Cueva del Peluche; A Mexican Enterprise with more than 10 years of experience on manufacturing, designing and commercialize plush toys with top of the line plush toys, with great originality and exclusivity of styles, we manufacture our products under extract quality control, from selecting our materials to manufacturing, wrapping and shipping. Our plush toys have great acceptance by children’s and adults due to the originality of our designs, their colors and their fine finishing guaranty you that it will be a toy that your children will keep for a long time, even after your children stop being a children and then this toy will be transformed into a nice memory of the years that went by, but though their fine colors and textures they will revive this memories time after time. A plush toy is not only a toy, it is also your pet, your mascot, your companion and your friend, it is also a symbol of friendship, love, repent, celebration and joy, they also say what we do not know how to say or we do not dare to say. For a long time they have being playing important rolls in our special days such as birthdays, anniversaries, valentine day, mother’s day and so many other special days that can be represented trough a plush toy. 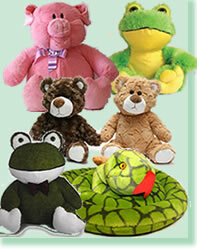 A plush toy is a way to express all those feelings. To make gifts trough our products in special dates, more that a thought, it has being a tradition for many years, not only in Mexico, since it is very difficult to find a place in the entire world where people is not used to give this type of products as a special present and even more difficult to find a children that does not have a plush toy as his inseparable friend in all his joys and despairs. Many years ago, teddy bears were the only styles available, today they are countless designs, shapes, motives and colors for them manufacturing.